Actually be able to move forward – with passion and speed – to reach your true potential! What is Fear of Success? what success means to you. My Fear of Success Hypnosis MP3 session will lead you through a process to boost your success motivation. Whether you are looking for career success, small business success, or more motivation, this Fear of Success Hypnosis MP3 download will help you overcome those old blocks to lead you on the path to great SUCCESS!. Steve G. Jones, Ed.D., Clinical Hypnotherapist, charges $1,500 for a custom recording and $25,000 for a one-hour private hypnotherapy session at his office. But you can get all the benefits for this low price. 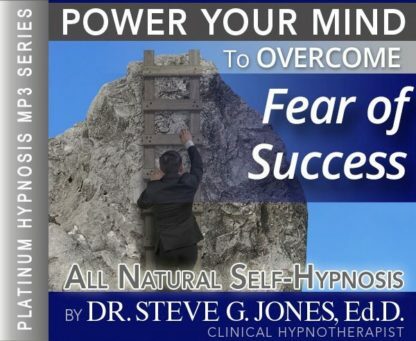 Simply listen to the Fear of Success Hypnosis MP3 recording every night as you go to bed for three weeks and feel the changes happening in your life. You will feel more empowered, more in touch with your true self, and you will truly know that your goals are within your reach. As strange as it might seem, some people are fearful of succeeding. For those who think that success is the ultimate accomplishment it may be hard to understand why anyone would shy away from it. When examined closer, those who are afraid of success are usually uncomfortable with some other aspect of their lives that would be magnified by achieving success. Hypnosis is the ideal venue for exploring the root causes of the fear of success. Hypnosis is a technique used to reach in beyond the surface and see beyond the obvious. If success means wealth, power, adoration by peers, and all of the fringe benefits that go with it, then it seems everyone would want success. So it makes sense that there is something behind this fear that is not visible from the surface. Hypnosis will go beyond the surface and explore and withdraw the real reasons for this fear. By helping those with a fear of success become relaxed, hypnosis can begin to examine past experiences and pent up feelings and ideas about success that are serving as an obstacle toward achievement. This is a process that takes approximately three weeks and can be done successfully through self hypnosis techniques. Do you purposely miss opportunities? Do you downplay all of your accomplishments with peers and family? Do you hold back thoughts or ideas that could put you in a position where you would “move up” in your career or within an organization? Do you sabotage your successful relationships by doing something that will make them end? These are a few of the self-defeating behaviors of those who are uncomfortable or fearful of success. Steve G. Jones, Clinical Hypnotherapist, has created “Overcome Fear of Success” as a self-hypnosis program that can explore and reverse these obstacles toward success and the happiness it can bring. Do you ever find yourself reaching for goal, but for some reason or another you aren’t able to accomplish your goal? You may have a fear of success. You have to be willing and wanting success in your life in order to allow it in. Perhaps you do things (without realizing it) that prevent yourself from reaching success. All of us want to be successful at something whether it is a job, sport, family, or relationship. Being successful takes work and it takes time. The most important part in becoming successful is figuring out what it is that you want. You cannot work towards a goal without first defining what that goal is. I encourage you to figure out what you want to be successful at. Think about what it would take to reach this goal. After you have defined your goal and developed a plan, then you can start working towards it. Realize that success takes time to achieve, so be patient and allow it into your life! And as you continue to relax, you realize just how powerful you are. And you realize that you are worth of success. You deserve to be successful. See it. Feel it. See and feel yourself being successful. Imagine yourself there. Notice what is surrounding you, that’s right. Notice your environment. Notice where you live when you are successful. Notice how you live. Notice how others treat you and how you are respectful to others, that’s right. You are a wonderful person and you deserve this success. Feel how good it feels to be successful in all areas of your life, mentally, physically, spiritually, financially, emotionally, that’s right, in all of the areas in your life…successful. See and feel yourself there, now. And realize that you will maintain your success. You will continue to be a successful person because your success is a positive event for all of those people in your life. You set an example of how people should and can live, how they can reach their full potential, so your success benefits everyone in your life, because by seeing you as a successful person, they realize their own potential. So by being successful, you benefit everyone in your life. Realize how much you deserve to be successful. You deserve it 100%. You deserve to be successful and as you breathe in deeply now, breathe in strength and courage and as you exhale, let go of fear, let it go. And as you breathe in, breathe in worthiness. You are worthy of all the good things life has to offer. And as you exhale let go of all the rest of the fear, let it go, that’s right. You are a successful person, feel it, that’s right. Feel it deep down inside. You have always understood deep down inside that you deserve to be successful and now you realize that it is absolutely true. It is your destiny to be successful and to maintain and increase that success. So relax and realize that you are successful and you will continue to increase your success day by day by taking those steps necessary to increase your success. And you take those steps in a very powerful way because you deserve to be successful. Relax, relax and realize just how successful you are and how much more successful you will become because you deserve this. The fear of success often occurs when people make long term goals such as a change in a career, losing weight, or reaching a dream. Being a success and reaching your goals often means that things will be different. And often at the root of the fear of success is the fear of change. With change comes uncertainty and with uncertainty comes fear. It makes sense that people often fear success, but realize that if you fear success, there is something you can do about it! Hypnotherapy will get to the bottom of your fear of success and it will re-program you to believe in yourself and help you work towards your goal. The Overcome fear of Success self-hypnosis program will help you figure out what you are scared of and help you get past this fear. With hypnosis, anything is possible because it helps you break down barriers and helps you reach your goals. Ultimately, your success will give you much more happiness in your life. Whatever is holding you back from reaching your goals is not worth it. Hypnosis will help you! Hypnosis will help you move past your fears so that you can focus on your goals and dreams. Hypnosis works by targeting your subconscious mind. Your subconscious mind is currently preventing you from becoming a success. With this hypnosis MP3 your subconscious mind will receive positive and powerful suggestions that will help you become a success! The Fear of Success Hypnosis MP3 recording will also help you become more motivated. Motivation is needed to be a success. You are worthy of success and hypnosis will help you become a success! We suggest you listen to the Overcome fear of Success self-hypnosis recording for 21 nights in a row before you go to bed. Within 21 short nights you will be on your way to become a success!